Grateful for few days of art, sunshine, and friendly faces in California. 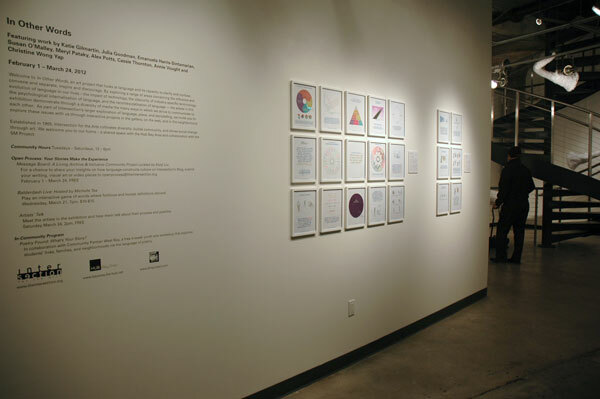 Thanks to everyone who came out to check out In Other Words at Intersection for the Arts in San Francisco. I really appreciate the interest and support! I think the show looks fantastic—all respect due to Kevin Chen, gallery director; Intersection staff, and the other artists for their thoughtful contributions. 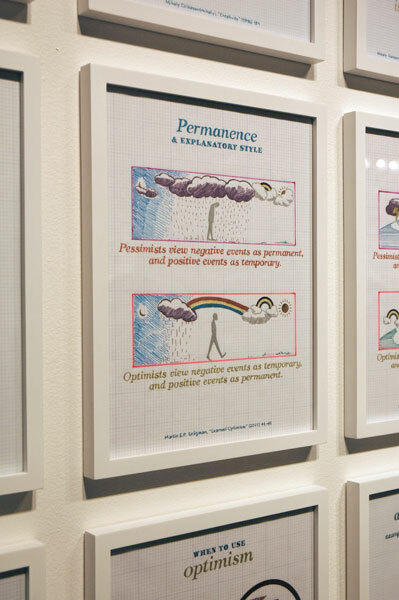 The show continues through March 24, with many public events—most are free or sliding scale. Here are a few snapshots, with better photos to follow on my site…. 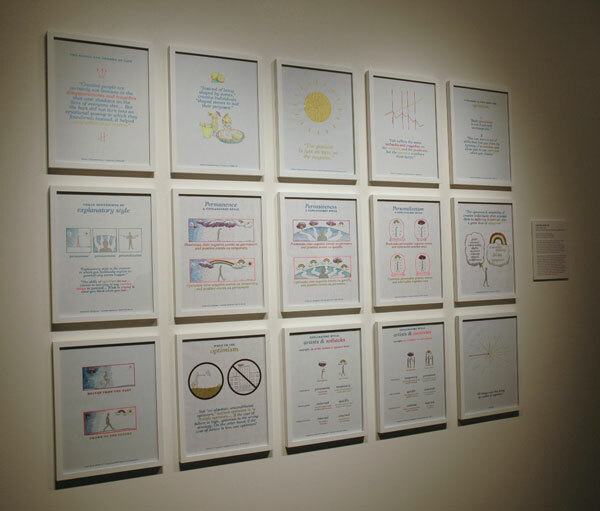 Positive Signs greets viewers at In Other Words, Intersection for the Arts, San Francisco, CA. Closer view of Positive Signs. In Other Words, Intersection for the Arts, San Francisco, CA. Detail: Positive Sign #16 at In Other Words, Intersection for the Arts, San Francisco, CA. 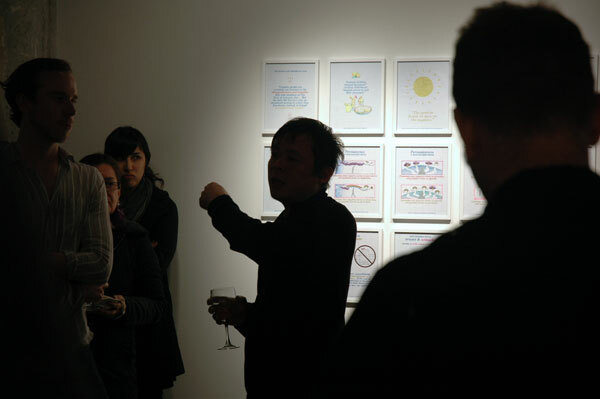 Intersection Gallery Director Kevin Chen (center) delivered thoughtful comments, connecting the show's linguistic theme with the gallery's location in the San Francisco Chronicle building. 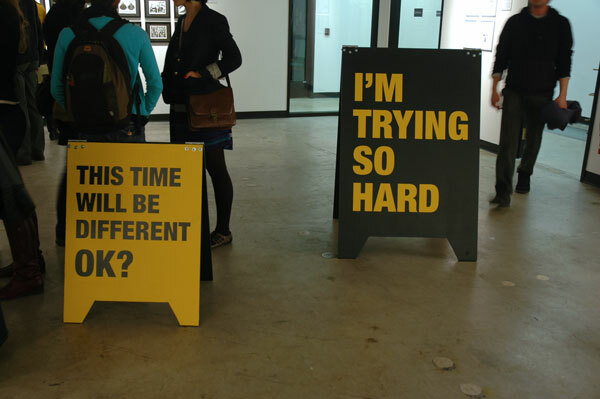 Susan O'Malley's sandwich boards. In Other Words, Intersection for the Arts, San Francisco, CA. Another project by Susan O'Malley involved semi-hidden placards. In Other Words, Intersection for the Arts, San Francisco, CA. 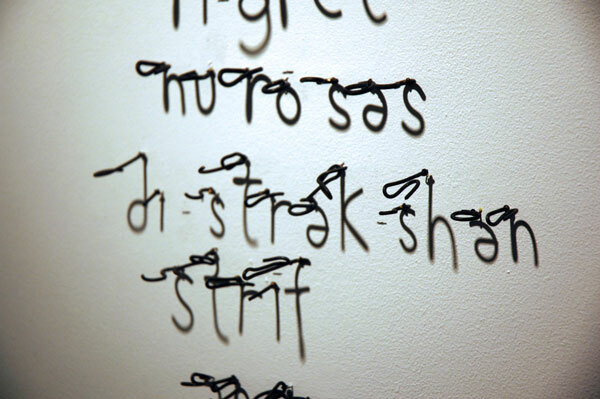 Meryl Pataky had a nice pair of installed wire works, whose shadows spelled positive and negative words phonetically. More photos, including the infamous pinkie cam treatment, on Alan Bamberger’s ArtBusiness.com site. Kinetic media installation by Mario Ancalmo, SECA 2010 exhibition, SFMOMA. 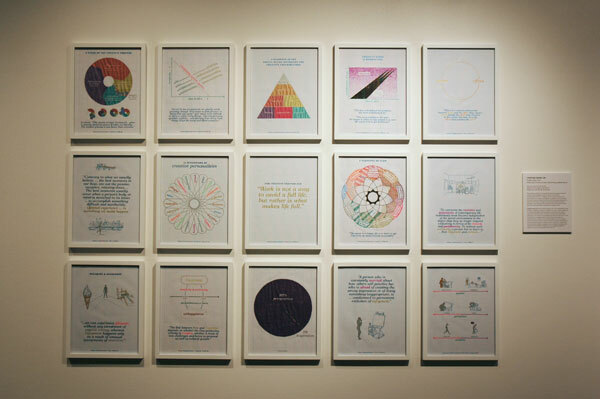 See also Ancalmo’s show at Eli Ridgeway Gallery; don’t miss the lower level installations. Deflated balloon dog by Jeffrey Songco, Steven Wolf Fine Arts. 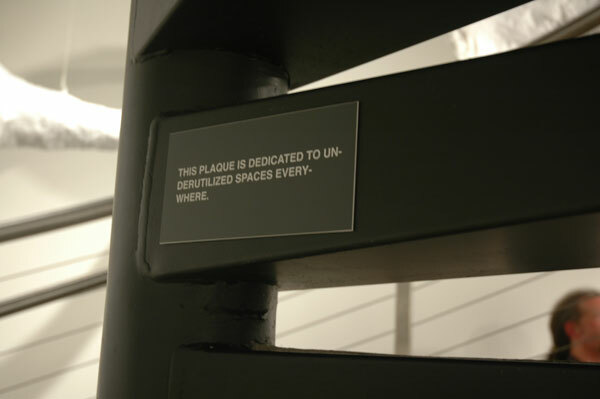 No photos, but worth checking out: Gina Osterloh’s solo show of studio photos and a documentary about blind massuers, connected by her interest in dysfunctions of the body of and Richard T. Walker’s video at ybca. Studio visit with Stephanie Syjuco. Studio visit with Michael Arcega. Baby, the artist-designed and -made collapsible, outrigger canoe, under a pinata-disco ball-hybrid. Not to mention an envy-inspiring woodshop in the studio. Mini disco ball, wood glue, and the story of a sailing expedition at Michael Arcega's studio. Free crate + casters + door + sawhorses = two tables that fold into one. Genius! Plus, (aerial) Geometry vs Abstraction.